Israel’s Declaration of Independence establishes a Jewish state which ensures freedom of religion and conscience to all. This does and should affect many aspects of life in Israel, but the specific concern of this resolution is the right to marry. 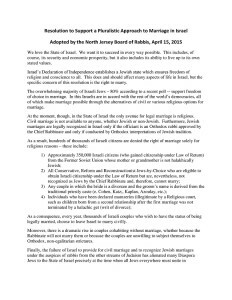 Therefore, be it resolved that we, the North Jersey Board of Rabbis, committed to K’lal Yisrael and the spirit of respect for democratic values and civil liberties articulated in Israel’s own Declaration of Independence and in many of its laws, urge the government of the State of Israel to take immediate measures to create a mechanism for civil marriage in Israel and to recognize Jewish marriages within Israel by rabbis of all streams of Judaism. These measures will not only deepen respect for Jewish religious diversity and enhance the principles of democracy in Israel; they will also strengthen the ties between Israel and world Jewry.